This is my 3 generations of love. In the middle is Tariq's paternal grandpa. He is 85 years old Alhamdulillah. 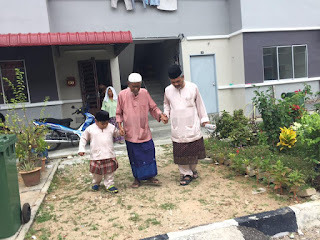 Despite his old age, wobbly legs and failing eyesight, he will follow us and make this trip to visit his sister's and brother's home every Raya. 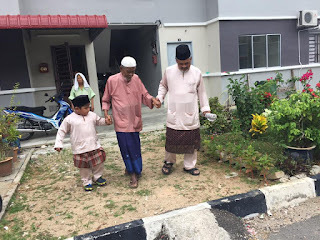 One of Malaysian's best culture is to travel far and wide just so we can visit our relatives and friends. And I absolutely love this culture. And the visiting is only one aspect to earn Allah's Love and Reward. Equally precious to me is the life lessons that we are able to impart to Tariq throughout the journey. 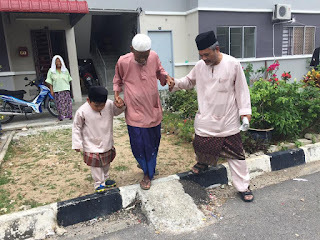 As all children is the case of 'we see and we follow', Tariq followed his Baba's example and would walk with his grandpa, holding his grandpa's fragile hands back and forth from our car to the home we are visiting. And I pray one day, Tariq and his son will walk us too if we ever reach that age and state, InshaAllah.